› Author Affiliations Funding The authors' research is supported by the DFG (SFB1123 TP A1) to Y.D. and C.W., by the DFG (SFB1123 TP A10) to J.D. and C.W. and by the Alexander von Humboldt Foundation to E.P.C.v.d.V. Inflammation has been well recognized as one of the main drivers of atherosclerosis development and therefore cardiovascular diseases (CVDs). 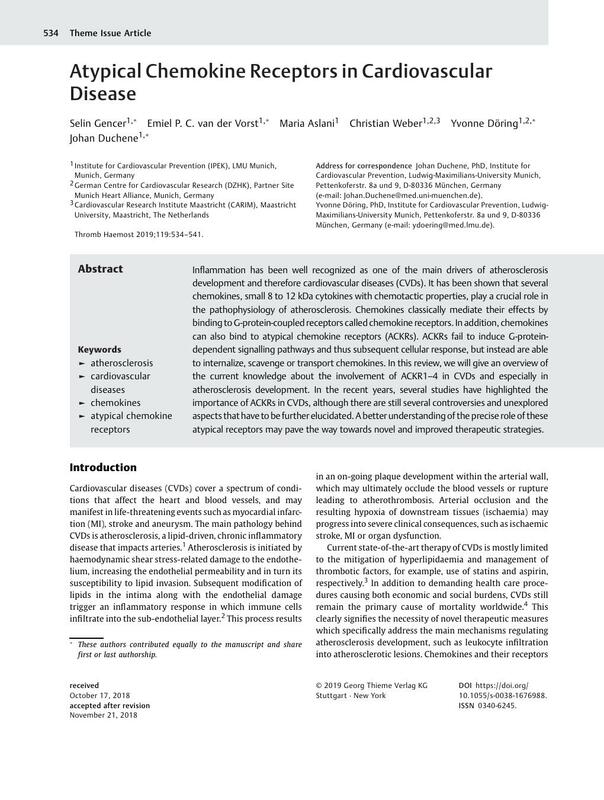 It has been shown that several chemokines, small 8 to 12 kDa cytokines with chemotactic properties, play a crucial role in the pathophysiology of atherosclerosis. Chemokines classically mediate their effects by binding to G-protein-coupled receptors called chemokine receptors. In addition, chemokines can also bind to atypical chemokine receptors (ACKRs). ACKRs fail to induce G-protein-dependent signalling pathways and thus subsequent cellular response, but instead are able to internalize, scavenge or transport chemokines. In this review, we will give an overview of the current knowledge about the involvement of ACKR1–4 in CVDs and especially in atherosclerosis development. In the recent years, several studies have highlighted the importance of ACKRs in CVDs, although there are still several controversies and unexplored aspects that have to be further elucidated. A better understanding of the precise role of these atypical receptors may pave the way towards novel and improved therapeutic strategies. After the acceptance of the current manuscript, a study by Girbl T et al demonstrating a new function for ACKR1 in leukocyte trafficking was published. This study showed that ACKR1, not only is involved in leukocyte adhesion11, but can also regulate leukocyte transendothelial migration. Indeed, CXCL2 produced by neutrophils is deposited on ACKR1 at endothelial junctions, and ACKR1-presented CXCL2 facilitates unidirectional luminal-to-abluminal migration of neutrophils. * These authors contributed equally to the manuscript and share first or last authorship.